Back to multi 455 per week again now, KF is sooooo boss!!! was not expecting it at this little 198-200lb bw until that one sunday afternoon a few weeks back when i tried to multi rep 405 and got to 5 reps. could have done another 1 or 2 rep but was outside the pins and dont want to make a scene. (x) = clusters of rep numbers with sub 60 sec rest to complete 1 big set. * might skip the 435 tmrw morning so i'm more fresh in the afternoon. i took the wed night off so il be doing double workouts til thur. * was planning on stopping at 405 for more energy to the afternoon heavy. the 405 felt like it was afternoon already. had to go 455 and got it without any issue. il probably get it again later after some 7hr sleep. 4:55 is my goal pace per mile for 2 mile+ in races, and weekly mile efforts. * feeling a lot stronger already. adding intensity to the shoulder pressing. as long as my back stays fresh, il keep this pace. * nothing special with my night time nap but felt very thick already in the morning. was stronger than yesterday afternoon. * legs feel strong but my back got a little beating from the 225 5x2 sets yesterday on the shoulder pressing. skipped the heavies on the squats for better recovery. * strong enough for 435 but skipped it for an easier 455 later. * did not tire or strained anything in the 455. will get good sleep and dinner. see if i can do this again tmrw morning. * i will stop counting the 455lb if i can get it on my working days consistently. even with 2x/day on my non-work days, i still get very weak on the bad side of the week. * got the 455. it was heavy. will see if i can be stronger tmrw after i get adjusted to the work schedule. * did not have a lot of time to gym today because of an evening dinner. did little things. still not 455 strong on a worknight. took the night off and will lift again sunday morning. * still weak from the work night. will get 455 tmrw. * strong for 455 but decided to skip because my back can be more fresh. will get it tmrw morning. skipped the shoulder pressing. * back felt a lot better this morning. skipped the shoulder pressing again and try for another 455 before my work week starts. * i did not physically tire myself at work this week as i'm mostly on the documentation side of work. mostly seating town. i still needed 3 workouts just to get back to the 455. i was off on sat morning. got good sleep on sat day. sat afternoon, sunday am and pm were still "post work" weak. * its not the muscle. IMO, the mental energy to tense the muscle is the difference here. if i'm well recovered on sleep, i can put more energy in keeping my legs as one solid unit and it always make me feel thicker. * exact copy of mornings workout. did not plan it. just happened. * was not happy with the explosiveness of the 405. sleep was good. just don't want to use too much this afternoon and burn out tmrw. tmrw will be a good day. * still not satisfied with how i overpowered the 405. the 455 would have been a fight. been trying to be healthy and avoid these very near max singles. * something in my lowerback got beat by all these 100lb 1 arm cable high pull. 405 was easy but i can tell that something inside there is not solid. skipped the heavys for today. * lowerback feeling very fresh in the past few days. * dont know if i will even think about adding the smith shoulder pressing anytime soon. no back soreness is a very good thing. * woot! second work night with a 455. will be nice to get it again tmrw. did not think i will be strong because i was having difficulty breathing from all this smoke. san francisco air quality so bad right now from all the fires. smells really bad outdoors. * 455 very heavy this afternoon but got it again. i still think you should enter a PL comp. don't even try to really max, just do it one day instead of regular training. 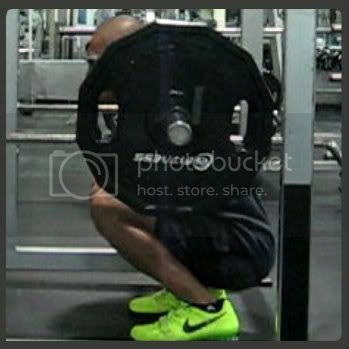 would be really interesting to see how much you can DL with no practice but a big squat and lots of back work. if he does one, he should just do one event (squat, obviously, lol). I really love "raw PL" (absolutely nothing, no belt, no wraps etc). Kingfish, how's your sister's marathoning/running going? LOL kf could break that squat record tomorrow. sister still running like forrest jump. 480lb at 198... interesting. there was a time not long ago that i did the 2nd 455 for the day and felt like i could have done 475 instead. i'm pretty good in guessing my near max weight for the day. * very cold morning. didn't feel like fighting the 455. could have 435 easily but saved it for later. * gear failure. i used a different board short today because of laundry sunday. i wrecked my shorts on the warmup sets. stopped and just do it tmrw. i was already strong. ohwell. * tried the full stack of 200 on the high lateral rowing. it was alright. could have done 5 but don't want anything to tire at this time. * 455 was easy today. i'm not getting as much sleep as i usually do because of a grind of gear pc game. still getting a combined 7.5hr+ of sleep per 24hr. * did daily 455s this week on my 4-night long work week. il stop counting these now. * finally overpowering the 455. skipped the backoff and see if i can do 465-475 tmrw morning. * worked 7pm-8am last night and slept 8:30am-12:45pm. lifted very early because gym closes at 2am thanksgiving day. was half asleep at the gym but still got my routine done. back home at 2pm and will sleep again to work tonight. * got off early from work and was able to take a few hrs nap in the early morning. took wed off and will not work until thursday night. plenty of time to do double workouts. eating more too and taking my bw to 204-208lb.